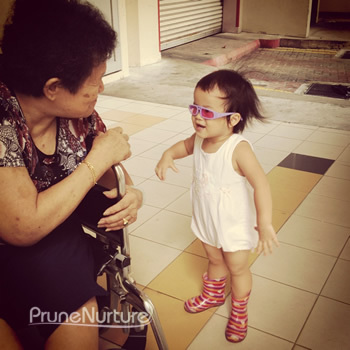 Dot talked with the elderly whom she always meets at the ground level about her pink glasses. I’m thankful that I have the privilege of seeing Dot grows day by day since birth. Now at 2-year 7 month old, she can manage simple conversations with me and people around her. And many times I am amazed at her growth and “maturity”, yet amused by the way she thinks and what she deems important to her at that point in time. Dot is having running nose and cough so I told her beforehand that she cannot eat ice-cream. I gave Dot thumbs-up for her apt reply. I was reading her story about Adam and Eve from her Toddler Bible. Our daily night prayer for Dot. Dot nodded her head and I prayed for God to heal her running nose and cough, and a good night rest. Satisfied, She laid down on her bed.